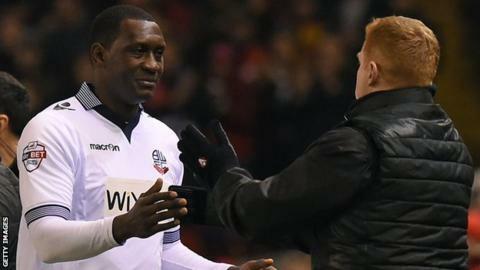 Former England striker Emile Heskey is hoping to earn a new contract for next season with Championship side Bolton. He joined the Wanderers on a short-term deal last December which was then extended until the end of this season. The former Liverpool, Birmingham, Wigan and Aston Villa forward, who said he will look to take his coaching badges next year, has scored once in 14 games for Neil Lennon's side. "I'd love to stay for another year, definitely," said the 37-year-old. He told BBC Radio Manchester: "I've enjoyed it. The lads have taken to me really well, I feel at home and I've got a great feeling for the club and the legs feel good. "I've played for so long it's about the enjoyment and putting on that shirt and every week I enjoy that." Bolton manager Lennon also revealed the club have made offers to goalkeeper Adam Bogdan, centre-back Matt Mills and midfielder Darren Pratley, all of whom are out of contract at the end of the campaign. "The ball's in their court now, I think we've made good offers," he said. "There will be a bit of to-ing and fro-ing obviously but hopefully we'll get over the line with all three." Who should Man City keep and sell? Read more on Manchester City: Who should stay and who should go?